Confusion and panic set in after a 3-year-old boy plunged into the Cincinnati Zoo's gorilla exhibit, according to 911 recordings released Wednesday, with the boy's mother pleading for help while repeatedly shouting at her son: "Be calm!" "He's dragging my son! I can't watch this!" the woman, who isn't identified, said in the 911 call Saturday after he dropped some 15 feet into the exhibit. Minutes later, the Cincinnati Zoo's dangerous animal response team shot and killed the gorilla to protect the boy. Since then, there have been numerous questions about how the boy got past the barriers around the exhibit. Police are investigating the child's parents and federal inspectors are planning their own review of the zoo. 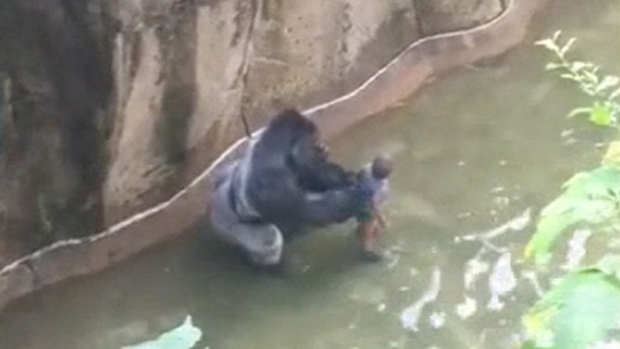 Cellphone video shows the tense moments when a 400-pound silverback gorilla manhandles a young boy who fell into its enclosure at the Cincinnati Zoo. Fearing the boy's life was in danger, a special zoo response team fatally shot the male western lowland gorilla named Harambe. The boy was taken to the hospital and later released. The boy's family didn't comment on the police investigation, but they did release a statement saying he continues to do well and expressing gratitude to the zoo for protecting his life. His mother said in the 911 call that her son had fallen into the exhibit and a gorilla was standing over him. The dispatcher told her that responders were on their way, and the caller yelled four times: "Be calm!" A record of police calls shows nine minutes passed between the first emergency call about the boy falling into the enclosure and when the child was safe. The zoo has an open viewing area that was among the first of its kind and is now common in many zoos around the country. The zoo says it will look at whether it needs to reinforce the barriers even though it considers the enclosure more secure than what's required. The breach, zoo Director Thane Maynard said, was the first time a visitor had entered its Gorilla World exhibit, which opened in 1978. A federal inspection less than two months ago found no problems with the exhibit. On Wednesday, the boy's family said he "is still doing well." The family said they continue to "praise God" and also are thankful to the zoo "for their actions taken to protect our child." While they have been blamed for the gorilla's death by some on social media, the family expressed appreciation for those offering support. The statement said some people have offered money, which they won't accept. "If anyone wishes to make a gift, we recommend a donation to the Cincinnati Zoo in Harambe's name," said the statement released through publicist Gail Myers. Police said their investigation will look at the parents' actions — not the operation of the zoo, which is overseen by the U.S. Department of Agriculture. Police then would discuss with prosecutors whether charges should be filed. At least two animal rights groups were holding the zoo responsible for the death of the 17-year-old western lowland gorilla, charging that the barrier made up of a fence, bushes and a moat wasn't adequate.